The United Launch Alliance (ULA) Delta IV vehicle has launched the classified NROL-32 payload for the United States National Reconnaissance Office from Space Launch Complex 37B, Cape Canaveral, at 5:58pm EST. The launch came after the first attempt was scrubbed for 48 hours due to issues suffered during fuelling – relating to anomalous temperature data signatures detected on the port and starboard strap-on common core boosters during cryogenic fueling. The Delta IV which will perform the launch is Delta 351, a Delta IV Heavy with three Common Booster Cores and an upper stage with a diameter of five metres. The first stage of the Delta IV is a Common Booster Core or CBC, powered by a single RS-68 engine. This will be augmented early in the flight by two additional CBCs attached to it on either side. 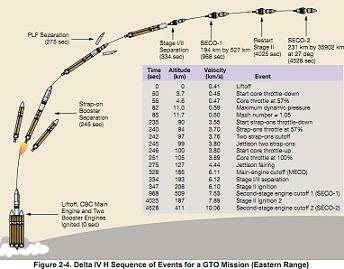 The second stage is the five metre Delta Cryogenic Second Stage or DCSS, which is powered by one RL10-B-2 engine. The Delta IV is one of two Evolved Expendable Launch Vehicles, the other being the Atlas V, which were developed to meet the requirements of the US military and the NRO. 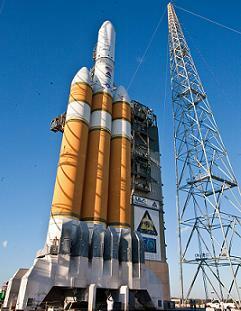 It made its maiden flight in 2002, when a Delta IV Medium+(4,2) launched the Eutelsat W5 satellite. The Heavy configuration first flew in December 2004, carrying a demonstration payload and two small satellites. Due to cavitation in the fuel lines, the boosters and first stage shut down early, and the spacecraft reached lower than planned orbits. 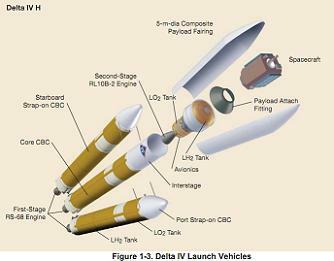 Delta 351 will be the fourteenth Delta IV to fly, and the fourth Heavy. The Delta IV Heavy is the only rocket in service that uses only cryogenic propellants; all of its stages use liquid hydrogen as fuel and liquid oxygen as an oxidiser. The payload, currently identified as NRO L-32, is the third NRO spacecraft to be launched on a Delta IV, and the second on a Heavy. The use of the Delta IV Heavy; the most powerful rocket available to the NRO, means that the spacecraft must have a high mass relative to the orbit regime into which it is to be inserted, or a smaller rocket would have been able to carry it. Three types of recently launched NRO satellites typically fall into this category; ‘Mentor’ GSO ELINT spacecraft, ‘Improved Crystal’ electro-optical reconnaissance satellites and ‘Lacrosse’ radar imaging satellites. Since the launch is taking place from Cape Canaveral, the rocket would be unable to reach an orbit compatible with an Improved Crystal satellite; such spacecraft operate in high inclination orbits which would require that the rocket fly over land, potentially dropping debris and spent stages, too soon after launch. Lacrosse satellites also operate in high inclination orbits, however they do not have as high an inclination as Improved Crystal, and two have launched from Cape Canaveral in the past, although most flew from Vandenberg. A Launch Hazard Area established for the launch extends to the East of Cape Canaveral, which suggests a low inclination launch. This means the payload is almost certainly heading to geosynchronous orbit, since it is the only low-inclination regime typically used by the NRO. It is therefore likely that this spacecraft is an electronic signals intelligence (ELINT) spacecraft. Current-generation NRO geosynchronous ELINT satellites, known as ‘Mentor’ or ‘Advanced Orion’, have been in service since 1995. Four are currently in orbit, and amateur observers have reported that they all still appear to be operational. The National Reconnaissance Office are believed to consider L-32 to be particularly urgent. USA-110, the first Mentor satellite, is believed to be located at a longitude of 127 degrees east. It has been in orbit for fifteen years, and is likely to be in need of replacement. Due to its longitude it cannot regularly be seen by amateur observers, and therefore its exact status is unknown. The second oldest spacecraft, USA-139, has been in orbit since 1998 and spent most of its service life at a longitude of 44 degrees East. Last year it was replaced by USA-202, but since then it appears to have been redeployed to a longitude of 14.5 degrees west. This may not be an important location, however, and it is possible that the spacecraft is merely being stored there, or that it is being used to provide additional non-critical data in a similar way to how NOAA have redeployed retired GOES satellites to cover South America. The only other Mentor satellite in orbit, USA-171, was launched in 2003 and is believed to be located at a longitude of around 95.5 degrees east. Despite being the second youngest in service, it is also fairly old and likely to be approaching, if not already past, the end of its design life. It has been reported that most NRO satellites have design lives of between three and eight years. Bruce Carlson, the Director of the NRO, described the spacecraft as being the largest ever launched. It is unclear exactly what he meant by this; it cannot be in terms of mass because several spacecraft have already been launched which are too heavy to fly aboard a Delta IV, for example Skylab. One possibility is that he was referring to the surface area of the spacecraft with arrays and antennae deployed. Mentor satellites are believed to have larger antennae than any other spacecraft, which give them a very large surface area. Carlson’s wording suggested that L-32 would be larger than any previous satellites, indicating that instead of being a Mentor satellite, L-32 could be the first in a new generation of larger ‘Improved Mentor’ geosynchronous ELINT satellites. The trajectory that Delta 351 will follow has not been officially announced, however the flight profile followed by Delta 310, the first Delta IV Heavy launch, is thought to have been based on that required to deploy USA-202, the most recently launched Mentor satellite. Assuming the same profile will be used for Delta 351, then as with all Delta IV Heavy launches, the RS-68 engines of the first stage and boosters will ignite five and a half seconds before liftoff. At T-0 the bolts securing the rocket to the launch pad will be released, and Delta 351 will begin its ascent to orbit. The vehicle is expected to head due East out over the Atlantic, heading for an equatorial orbit. The first stage engine will throttle down around fifty seconds into the flight to conserve fuel whilst the boosters provide thrust, and about eighty seconds after launch the vehicle will pass through max-Q, the point in the flight at which it experiences maximum dynamic pressure. Seconds after reaching max-Q, the rocket will also pass through Mach 1 and begin travelling at supersonic speed. About two and a half minutes after launch, Delta 340 will roll to bring the CBCs level. A little over eighty seconds later the boosters will throttle down in preparation for cutoff, whilst the core stage will continue to burn normally. About 245 seconds into the flight the boosters will complete their burns, and their engines will shut down. Three seconds later they will be jettisoned, and one second later the first stage will throttle-up to full thrust. About sixty eight seconds later the engine will begin to throttle down as it approaches cutoff. Cutoff will occur a little over five minutes and thirty three seconds into the mission, and will be followed seven and a half seconds later by stage separation. The second stage nozzle will then extend, and thirteen and a half seconds after staging the RL10 will ignite for its first burn. The payload fairing will separate from around the spacecraft about ten seconds later. At around this point the launch video will be terminated, and no further updates are expected, except one to confirm the outcome of the launch after spacecraft separation. If the Delta 310 profile is used, then the first burn of the second stage will last six minutes and fifty three seconds, and will be followed by a coast phase lasting seven minutes and forty two seconds. The second burn will then last eight minutes and two seconds, placing the upper stage and payload into a geosynchronous transfer orbit. Once the second burn is complete, a longer coast phase will occur, lasting five hours, eight minutes and forty two seconds, whilst the vehicle ascends to the apogee of its orbit. At apogee the second stage will restart for a third burn, lasting three minutes and fourteen seconds, to insert the spacecraft directly into geosynchronous orbit. The second and third burns of the Delta 351 mission may be slightly shorter as the Delta 310 mission was aimed slightly above geosynchronous orbit to avoid placing unnecessary debris into geosynchronous orbit, in the event it never reached this orbit due to the fuel cavitation problem. Delta 351 will be the twentieth to launch from Space Launch Complex 37B (SLC-37B) at Cape Canaveral. SLC-37 was originally built in the 1960s as a backup launch site for Saturn I rockets, and supported eight launches in support of the Apollo programme. At the time, it was known as Launch Complex 37, or LC-37. The first six launches from the pad were of Saturn I rockets, which flew in 1964 and 1965. In 1966 a configuration consisting of the first stage of the Saturn I and the second stage of the Saturn IB, flew from the complex. This launch is sometimes identified as a Saturn IB, and sometimes as a separate rocket called an “Uprated Saturn I”, however that name has also been used as an alternative name for the IB. A full Saturn IB made the last Saturn launch from the complex in 1968, carrying Apollo 5, the first flight of the Lunar Module. Although LC-37A was completed, it never supported a launch, and all eight launches were made from LC-37B. LC-37 was intended for use in the 1970s in support of the Apollo Applications programme, however when this was scaled back to just Skylab and ASTP it was found to be more economical to modify Launch Complex 39 to accommodate the Saturn IB than to reactivate Launch Complexes 34 and 37. The facility was demolished in the early 1970s. In the late 1990s, Boeing began construction work on the modern SLC-37B, and the complex was rebuilt in time for the maiden flight of the Delta IV in 2002. LC-37A was not rebuilt. Delta 351 will be twelfth Delta IV to use the complex, with the other two launches having taken place from Space Launch Complex 6 at Vandenberg Air Force Base. Delta 351 is the third and Delta IV, and the seventh and last EELV, to launch this year. Previous Delta IV launches have deployed the GOES 15 weather satellite, and the USA-213 Global Positioning Satellite. Atlas V launches this year have deployed the Solar Dynamics Observatory, USA-212 – the first flight of the X-37B Orbital Test Vehicle, USA-214 – the first Advanced Extremely High Frequency communications satellite, and USA-215 – another classified NRO payload which is believed to be a radar imaging spacecraft. The next launch of Delta IV is expected to occur in January, when another Heavy will be launched, carrying NRO L-49 from SLC-6 at Vandenberg. The next Delta IV launch from Cape Canaveral is expected to occur in March with a Medium+(4,2) configuration launching NRO L-27. L-32 is the second NRO payload to launch this year, and five are expected next year. In addition to L-32 and L-27; L-34 is expected to launch in March on an Atlas V, L-66 is also expected in March, using the much smaller Minotaur I rocket, and L-15 is expected to launch on a Delta IV Heavy in December.